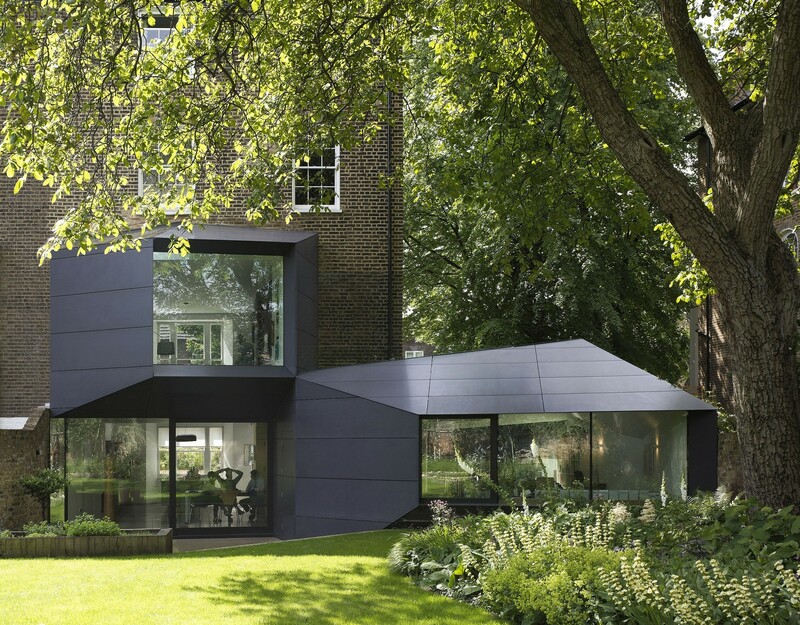 Alison Brooks Architects has extended a nineteenth century house in north London with two tapered volumes that project into the garden. The first volume wraps around the brick walls at the side and rear of the house to create a home office, while the second volume extends out at the back to increase the size of the first floor living room. The extensions are part of an overall transformation of a classic Victorian semi-detached villa for a client involved in photography and design. The extension was designed as a series of large apertures framed and connected by large trapezoidal planes. These openings capture light throughout the day, draw the garden into the house, and frame precise views of a spectacular walnut tree. Each plane of the scheme is either fully glazed or fully solid, there are no punched windows. This approach creates an architecture without mass and weight. It is more like the folded surfaces of origami. Where the side and rear projections converge, seven surfaces come together at one point. Where the original living room once was, ABA has opened a new double height volume. This space draws south light deep into the house, and like a ‘great hall’, creates a powerful visual connection between the original upper ground floor entrance hall and kitchen/dining space. The folded geometries of the extensions continue into the house to become surfaces punctuated by steel fireplaces, a cantilevered kitchen and other ‘inhabited walls’; a variety of framed settings for modern family life.